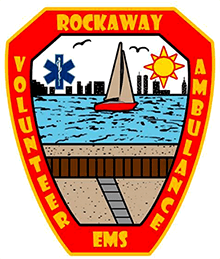 The Rockaway Volunteer Ambulance Search and Rescue Corps (R.V.A.C) is a non-profit organization that provides service to the Rockaway community. The jurisdiction includes the areas of Rockaway, Far Rockaway and Rockaway Beach, all located in the Queens section of New York City. The population of over 180,000 is currently without a local ambulance service. Two devastating events over the last two years have created a need for this localized rescue and ambulance service to respond to the residents of the Rockaways. The first was the closing of one of the only two hospitals on the island. The Peninsula Hospital closed after some financial hardships and with it the ambulance service that responded from there. After the hospital closure, with increasing response times from city ambulances, a group of residents with EMT and Rescue Training decided to help their community and start the volunteer ambulance corps. As the RVAC was gearing up to serve local residents, raising funds for insurance and other necessities, the second more devastating event took place, Hurricane Sandy. The Rockaways were hit especially hard by the Super Storm. As Chief Ronnie Murchison explains, “Hurricane Sandy impacted thousands of residents, destroying homes, cars, school, stores, churches, and even our boardwalk. The community will never be the same again. Everything we had stored was lost, but we aren’t going to let that stop us.” Currently the response time for a city ambulance is between 10 to 20 minutes, and for critical medical emergencies in a large city, that is a long time. In contrast, the RVAC expects response times to fall below 8 minutes once they are again operational. And they have big plans. on-scene care while awaiting transport. The Beach & Bay Rescue, which is called Rockaway Volunteer Search and Rescue Team (R.V.S.R), will have a special team go through training with the Coast Guard; then trained personnel will patrol the surrounding waters with boats and jet skis. RVAC will also train all their volunteer members to certify as EMTs while holding free classes for the community in CPR and first aid. The RVAC is reaching out for help from other responder agencies, private businesses, and any who would like to assist. The community has received little assistance from government agencies, so any and all donations are appreciated.